Without fail, as soon as the days get shorter and your horse’s coat starts getting fuzzier, we seem to find ourselves knee-deep in “mud season”, usually lovingly referred to as autumn. This is the best time to stay on top of thrush, and keep it under control before it gets into their sole, if you know what I mean. Thrush. If you don’t know what thrush is, you will now that you smell it. It is a bacterial/fungal infection affecting the frog and (occasionally) any cavities that may have formed in the sole. Visually, it tends to darken the sole/affected frog, and softens it into a vulnerable state if not managed. Regular trims help keep the sole from growing odd, narrow pits and cavities that can trap mud and manure, which can deepen and become breeding grounds for bacteria. Trimmed or not, all that damp debris that collects in the sulci or clefts of the frog need to be cleaned out regularly to prevent infection. 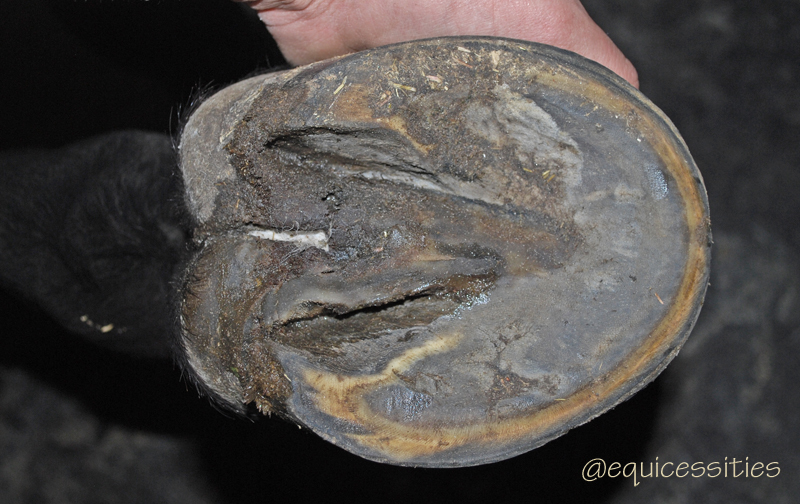 Clean, dry bedding helps as well as daily picking of the feet. How can I make it go away? Anti-septics can be easy to pour onto the affected area once the feet have been thoroughly cleaned with all the debris brushed clear. Be advised, however, that if the thrush is deep and causes sensitivity or pain, some anti-septics might be painful. Hydrogen peroxide is pain-free, and betadine is safe and effective to use, or white vinegar. If you catch it early on, it can be as easy as just keeping the feet clean. Deep sulci can be kept clean(er) by stuffing cotton balls down into the deeper pits. Just stretch them gently and tuck them along the areas needed. Use the hoofpick, if needed, or just your finger to push them down in. When the sole is notably tender (they try to pull their foot away when you pick or poke it), or there is obvious black gooeyness to areas of the sole, a more pro-active method of treatment is definitely advisable. Thoroughly clean the sole, sulci and cleft of the frog with Betadine (read the label for complete instructions for safe use). Push betadine-soaked cottonballs down into the affected areas and gently push through with a hoofpick until they come out clean. Pack betadine–soaked cotton balls into the affected areas to be left in. The next time you clean their feet (ideally every day), clean them with hydrogen peroxide and re-pack with betadine-soaked cotton balls for 2-3 weeks or until the blackness starts to clear away. One of the easiest ways to treat thrush I have tried to date might also be the most effective. I started using Absorbine Veterinary Liniment after cleaning the feet thoroughly by spritzing it out of a sprayer directly into the affected deep sulci and clefts then padded the tight areas with dry cotton balls to keep out debris. Within days, I noticed the thrush drying up. In lieu of the sprayer, just soak cotton balls with the liniment and press down into well-cleaned affected areas of the feet to flush them out, and then press a dry cotton ball down in to protect the area. For deep sulci or hooves with deep crevices and prone to thrush, leaving dry cotton balls stuffed in the deep areas is an easy and effective way to prevent thrush from worsening or recurring during muddy seasons, or if you are unable to clean their feet daily.They help to keep mud and manure from getting trapped within, providing a barrier instead. They can fall out though! During my temporary lack of Betadine, I used Dettol (another anti-septic for wounds/abrasions) mixing 15mL, or 1 capful, to 300mL of cool water. I washed his sole and squished Dettol-soaked paper towel wads into the sulci to flush the debris out, then proceeded with cottonballs until they were clean. Next, I flushed hydrogen peroxide-soaked cotton balls through before leaving dry ones packed in for the night. For more serious cases, raw honey is another alternative that is an anti-bacterial and safe to be packed in for longer periods. As you can see, there are MANY ways to treat thrush. The idea is to keep them clean and dry! EDIT Nov. 20, 2014: Added section to include mention of Absorbine Veterinary Liniment.